Last in stock In stock 1 pair. Also available in our walk-in store. German shoulder strap pads. 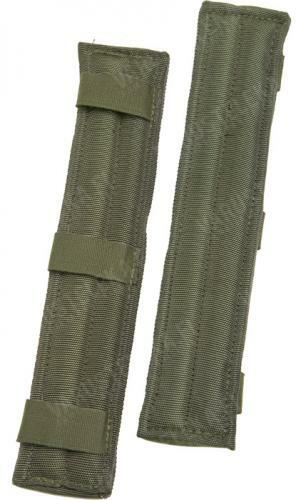 These fit directly onto the older model Gebirgsjäger rucksack, but can also be used with most straps 4 cm wide. Length about 30 cm, loop width 4 cm. This is the top of the top of shoulder strap 5/5 of this classic item . These are well made but they have a VERY strong plastic chemical smell. I’m hoping the smell fades. "Pehmuste." Tällä saa lyömällä oravaa pienemmältä otukselta hengen pois. Tarkoitus on varmaan kasvattaa hihnan pinta-alaa jolloin se hiertää vähemmän mutta pehmeydessä on tosiaan toivomisen varaa. Not really comfortable and they keep sliding, but they're inexpansive and do the job.